So which focal length is the closest to the model’s actual face shape? The shorter the focal length, the closer to the face. That is why the nose looks bigger in the 20mm lens shot than in the 200mm lens shot. 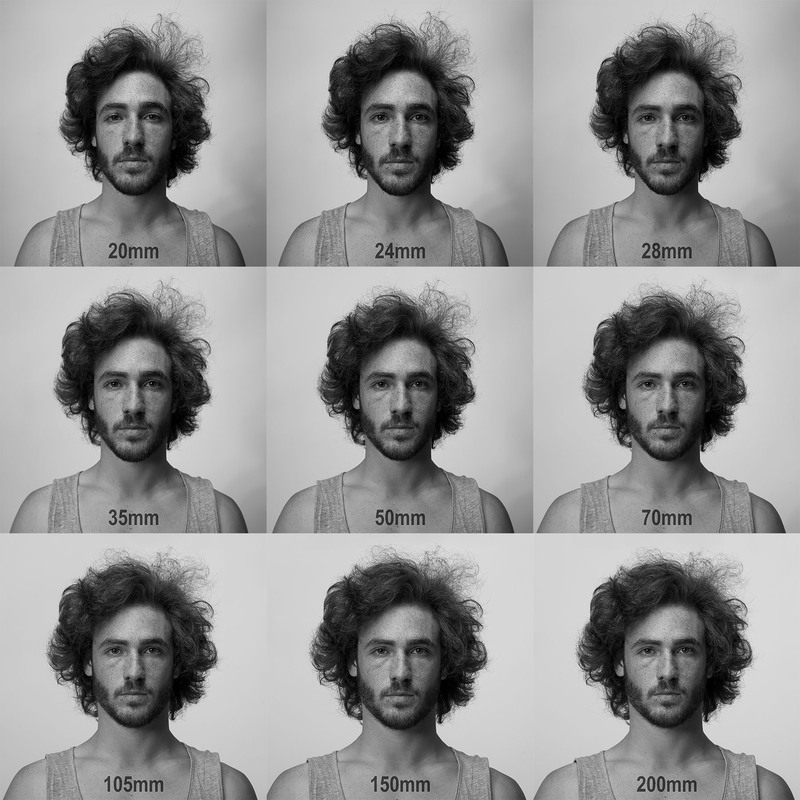 If all photos were taken at the same camera distance, the face would look the same for each lens, however, the head size would change – smaller for the 20mm lens gradually getting larger up to the 200mm lens. So which distorts the least and which camera did you use?? sure it’s not 50% the hair and how high the head is held, between 20 and 28? but still i love it. Very cool!, your gif is a big hit on social media. I LOVE this! Excellent method to your teaching important tenets of photography. We look forward to more from you in photos and teachings. These are cool images but I think it’s worth putting some effort to explain exactly what’s going on here. The reason the subject is occupying the same amount of space on the frame is because each time a longer focal length is used, the photographer is physically moving the camera farther away from the subject. The longer focal lengths actually have a more narrow field of view and so in order for the subject to appear to occupy the same space, the photographer must move back (otherwise you’d get the effect of “zooming in”). How is that significant? Because the closer you are to the subject, the more substantial the distance between his features are. If you’re only standing 9 inches away from the man, his nose will be very close to you and his shoulders might be 3-4 times farther away from you than his nose; his nose will look quite a bit larger. It’s just like using a forced perspective technique by taking a picture of an arm where the fingers are right up near the lens but the person is standing in front of the lens; his fingers might occupy the same amount of space as his head! As you physically move backwards, the relative distance of those features to each other doesn’t change but their relative distance to the camera does! Using a 200 mm lens you might need to be standing back a good 20 feet to get a picture like this (just estimating). At that distance, the subject’s shoulders are no longer 3-4 times farther from you than his nose; both his nose and shoulders are about the same distance from you. The result is that the nose gets less distorted and the subject flattens out quite a bit. You can test this out yourself, simply look at a person while standing very close and then look at them from far away; there’s no real trickery here, the same thing happens with your eyes (you just can’t freeze the moment in time and review it later). This is why when I do shoots for people who are self-conscious about their weight I tend to use a lens with a shorter focal length and wider field of view because it forces me to get closer to them. Getting closer to the subject causes their body parts to overlap more. Especially for female clients, this generally results in their curves overlapping in more flattering ways. Shooting from far away with a telephoto lens tends to flatten subjects out and make them look heavier. This is also why sports photography, especially sports videography, tends to have that strange effect where two players are actually a fair distance from each other but they seem to be standing right next to each other. The photographer might be 400 m away from them and the players are 10 m away from each other. At nearly 30 feet apart they’re not even close enough for a casual conversation but relative to the extreme distance of the photographer, they’re actually pretty close, and their sizes relative to each other will not be that extreme for that same reason. The stars in the night sky have a similar effect. The objects your seeing are vastly different in size and even shape but they’re all so very far away that their relative sizes are often hard to distinguish. Wonderful explanation. I wish he would have included (and emphasized) the distance in the gif, and included the focal length as sort of extra, since the real culprit is the distance itself, and the focal length doesn’t matter, other than to keep the framing. The last comment about stars isn’t quite right: most objects in the night sky are too small for the unaided eye to resolve at all, so they all look like points. These objects often do have very different apparent sizes as viewed from Earth (they can differ by more than a factor of 1,000 for stars visible to the unaided eye), but you need magnification, sometimes to extreme levels, to get any hint of the size differences. For most stars, it’s even difficult for large telescopes to measure relative sizes directly. Often the apparent size is measured indirectly by looking at the combination of how far away it is, how bright it is, and what its temperature is. In general, the situation with astrophysics is the exact opposite of that you describe here: the distances between stars are absolutely massive. If you see two stars on the sky, one could easily be a thousand times further away if it’s a brighter star. So the astronomy situation is more analogous to forced-perspective illusions that people use sometimes, like taking a photo of a person in the foreground to make them look the same size as a statue in the background, or to make it look like a person in the foreground is going to smash a tiny person with their fingers. Congrats, your article was featured in a Belgian newspaper (link below). Note though, that the change in perspective and proportions is not caused by the focal length of the lens, but by your moving closer to or farther away from the subject. If you put your camera on a fixed tripod and shoot a 50mm and a 100mm portrait, the person will look 100% identical in both, except that the 50mm shot shows more of his surroundings (and that the person is recorded on fewer pixels than in the 100mm shot). This is not an example of focal length’s affect on the shape of a face, but the affect of DISTANCE between the subject and the camera’s affect on the face. It’s perspective distortion, not lens distortion. If you were to put a 200mm lens on the camera, frame the face, and take a photo, then swap for a 24mm lens without moving the camera, and take a photo, then crop the second photo to match the framing of the first, the face will look exactly the same in both photos. I am a figurative painter in NYC, I work with models and photography, the camera distorts the face, this will be so helpful. Can’t wait to work with this in the studio. It would be interesting to know how far is the distance from the subject to the camera for each focal length. Would you kindly share this info with us? Excellent post. Which focal length is look the guy in real life ? Thank you for sharing your very useful experiment. Just wondering what sensor size your camera has. Full frame or aps-c? I was taught that the best focal length for a head and shoulder image is one that is twice the diagonal of the film format. IE about 105mm for 35mm, 150mm for 645, 150mm for 6×6, 180mm for 6×7. This worked well for me. The feature compression looks very natural and the camera to subject distance was comfortable for the client while giving me space to move lights through the space easily.